Here we go again with the Shirokiya Ramen Festival. This time it's Hide-Chan Ramen. Nope, this isn't the same as the Hide-Chan restaurant on King Street...this one's straight from Fukuoka, and specializing in Chili-oil Ramen, "Black Style Ramen" with fried garlic oil, and also Kiwami Ramen topped with lots of veggies! So far, I've tried their Black Style Ramen and their Chili-oil Ramen. My favorite? The Black Style is really tasty, and one of my favorites of all the ramen booth so far. If you're a spicy fan, I suggest ordering the Chili-oil ramen. Although it was a bit too spicy for me to finish, I did enjoy trying something out of my comfort zone. 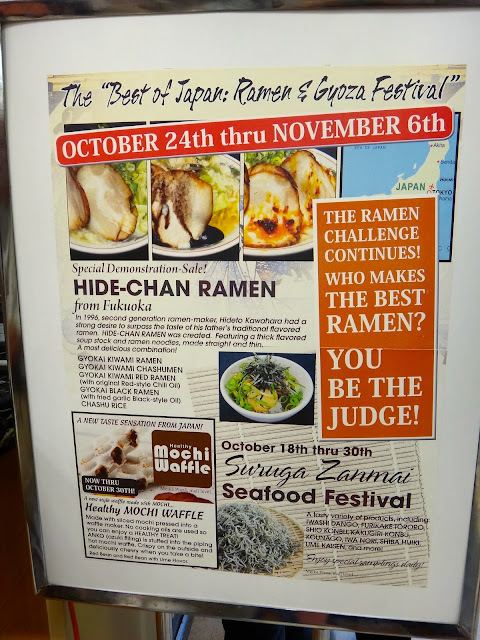 I really enjoyed Hide-Chan's ramen. One, for the toppings included- not only ramen noodles and chashu, but also lots of healthy veggies! It also looks like it's more food for your buck. I felt much more full than when I had eaten the other Shirokiya ramens in the past. Oh and two more pluses? You can get your ramen to-go and they add no MSG! #3- their #1 recommended choice! Sweet Potato Mochi you MUST try. As a not-so-big sweets fan, this was my ultimate dessert. Creamy, slightly sweet and small enough to end a big ramen meal! If you don't like ramen, I highly recommend picking up this Bento. The Butterfish is so tender and creamy! And all of this for under $10!